Gnomes live in Mount Nevermind, on the isle of Sancrist. 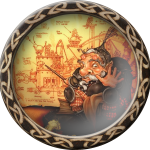 Gnomes are the tinkerers of Krynn, designing grand machines for every imaginable task. Distant cousins of the dwarves, gnomes who chased after the Graygem are rumored to have been transformed from gnomes into dwarves and kender, depending on whether they coveted the stone or were curious about it. Gnomes live for approximately 350 years.